Saint Peter (Syriac/Aramaic: ܫܸܡܥܘܿܢ ܟܹ݁ܐܦ݂ܵܐ, Shemayon Keppa, Hebrew: שמעון בר יונה‎‎ Shim'on bar Yona, Greek: Πέτρος Petros, Latin: Petrus; r. AD 30; d. between AD 64 and 68), also known as Simon Peter, Simeon, or Simōn, according to the New Testament, was one of the Twelve Apostles of Jesus Christ, leaders of the early Christian Church. He is also the "Apostle of the Apostles", an honor 3rd-century theologian Hippolytus of Rome gave him, and the Roman Catholic Church considers him to be the first pope, ordained by Jesus in the "Rock of My Church" dialogue in Matthew 16:18. 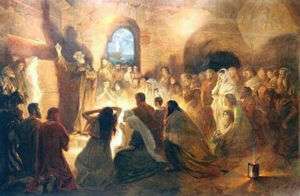 The ancient Christian churches all venerate Peter as a major saint and associate him with founding the Church of Antioch and later the Church in Rome, but differ about the authority of his successors in present-day Christianity. 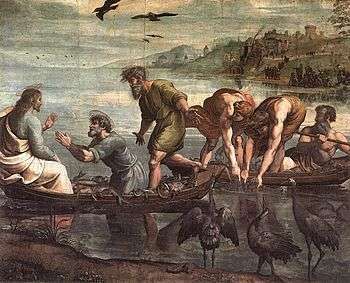 The New Testament indicates that Peter was the son of John (or Jonah or Jona) and was from the village of Bethsaida in the province of Galilee or Gaulanitis. His brother Andrew was also an apostle. 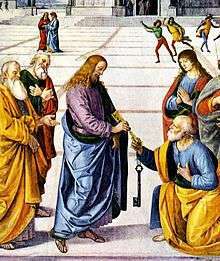 According to New Testament accounts, Peter was one of twelve apostles chosen by Jesus from his first disciples. 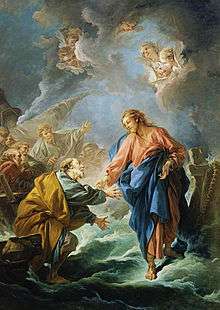 Originally a fisherman, he played a leadership role and was with Jesus during events witnessed by only a few apostles, such as the supposed Transfiguration. 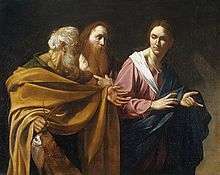 According to the gospels, Peter confessed Jesus as the Messiah, was part of Jesus's inner circle, thrice denied Jesus and wept bitterly once he realised his deed, and preached on the day of Pentecost. Two general epistles in the New Testament are ascribed to Peter, but modern scholars reject the Petrine authorship of both. The Gospel of Mark was traditionally thought to show the influence of Peter's preaching and eyewitness memories. Several other books bearing his name – the Acts of Peter, Gospel of Peter, Preaching of Peter, Apocalypse of Peter, and Judgment of Peter – are considered by Christian churches as apocryphal, and are thus not included in the canon of the Bible. Peter's original name was "Shimon" or "Simeon" ("Simon" in modern English). He was later given the name "Peter", New Testament Greek Πέτρος (Petros) derived from πέτρα (petra), which means rock. In the Latin translation of the Bible this became Petrus, a masculine form of the feminine petra (f), which is a loanword from Greek still meaning "rock." Another version of this name is Aramaic: ‎‎ (Šimʻōn Kêpâ Sëmʻān Kêpâ), after his name in Hellenised Aramaic. The Syriac or Aramaic word for "rock" is kepa, which in Greek became Greek: Πέτρος, also meaning "rock". 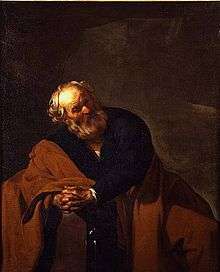 He is also known as Simon Peter, Cephas (Greek: Κηφᾶς) and Kepha (Hebrew: כיפא‎‎). Both Cephas and Kepha also mean rock. 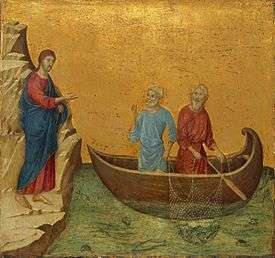 Peter was a fisherman in Bethsaida.[Jn. 1:44] He was named Simon, son of Jonah or John. The three Synoptic Gospels recount how Peter's mother-in-law was healed by Jesus at their home in Capernaum[Matt. 8:14-17] [Mk. 1:29-31] [Lk. 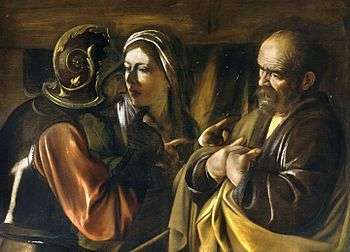 4:38]; this passage clearly depicts Peter as being married. 1 Cor. 9:5 has also been taken to imply that he was married. John Vidmar, a Roman Catholic scholar, writes: "Catholic scholars agree that Peter had an authority that superseded that of the other apostles. Peter is their spokesman at several events, he conducts the election of Matthias, his opinion in the debate over converting Gentiles was crucial, etc. According to Acts of the Apostles Peter and John were sent from Jerusalem to Samaria (Acts 8:14). Peter/Cephas is mentioned briefly in the opening chapter of Paul's Epistle to the Galatians, which mentions a trip by Paul to Jerusalem where he meets Peter (Galatians 1:18). Peter features again in Galatians, fourteen years later, when Paul (now with Barnabas and Titus) returned to Jerusalem (Galatians 2:7-9), and then, when Peter came to Antioch, Paul opposed Peter to his face "because he [Peter] was in the wrong" (NIV) (Galatians 2:11). Roman Catholics view Peter as the first pope. 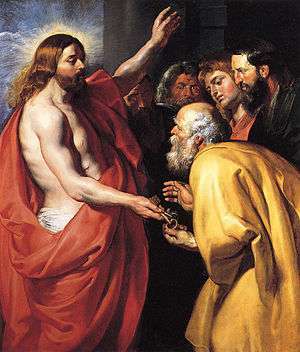 The Roman Catholic Church asserts that Peter's ministry, conferred upon him by Jesus of Nazareth in the gospels, lays down the theological foundation for the pope's exercise of pastoral authority over the Church. While the church in Rome was already flourishing when Paul wrote his Epistle to the Romans about AD 57, he greets some fifty people in Rome by name, but not Peter whom he knew. There is also no mention of Peter in Rome later during Paul's two-year stay there in Acts 28, about AD 60-62. 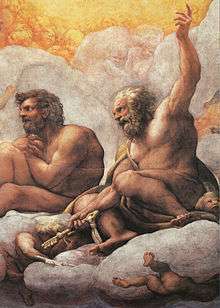 Some church historians consider Peter and Paul to have been martyred under the reign of Nero, around AD 65 such as after the Great Fire of Rome. Presently, most Catholic scholars, and many scholars in general, hold the view that Peter was martyred in Rome under Nero even though there is no biblical or historical evidence Peter was ever in Rome. In two extensive studies published respectively in 2009 and 2013, Otto Zwierlein stated that "there is not a single piece of reliable literary evidence (and no archaeological evidence either) that Peter ever was in Rome." Zwierlein's theses caused a debate especially among German scholars. Zwierlein has made a summary of his view available online in English. In the epilogue  of the Gospel of John, Jesus hints at the death by which Peter would glorify God,[Jn. 21:18-19] saying "when you are old you will stretch out your hands, and another will dress you and carry you where you do not want to go." 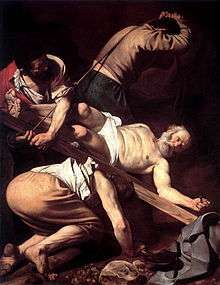 This is interpreted by some as a reference to Peter's crucifixion. 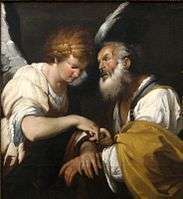 Theologians Donald Fay Robinson and Warren M. Smaltz have suggested that the incident in Acts 12:1-17, where Peter is "released by an angel" and goes to "another place", really represents an idealized account of his death, which may have occurred in a Jerusalem prison in as early as 44 AD. The Muratorian fragment, dated to the second century A.D., notes that the primary eyewitness to Acts, Luke, was not present at Peter's death. However, early Church Tradition (as indicated below) says that Peter probably died by crucifixion (with arms outstretched) at the time of the Great Fire of Rome in the year 64. 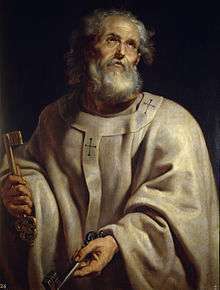 The writings of the 1st century Church Father Ignatius of Antioch refer to Peter and Paul giving admonitions to the Romans, indicating Peter's presence in Rome. Margherita Guarducci, who led the research leading to the rediscovery of Peter's reputed tomb in its last stages (1963–1968), concludes Peter died on 13 October AD 64 during the festivities on the occasion of the "dies imperii" of Emperor Nero. This took place three months after the disastrous fire that destroyed Rome for which the emperor (Nero) wished to blame the Christians. This "dies imperii" (regnal day anniversary) was an important one, exactly ten years after Nero ascended to the throne, and it was 'as usual' accompanied by much bloodshed. Traditionally, Roman authorities sentenced him to death by crucifixion. According to the apocryphal Acts of Peter, he was crucified head down. 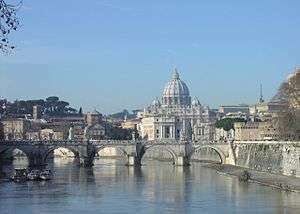 Tradition also locates his burial place where the Basilica of Saint Peter was later built, directly beneath the Basilica's high altar. Origen in his Commentary on the Book of Genesis III, quoted by Eusebius of Caesaria in his Ecclesiastical History (III, 1), said: "Peter was crucified at Rome with his head downwards, as he himself had desired to suffer." 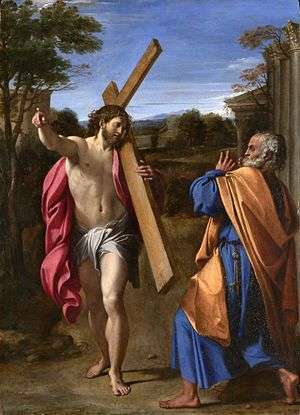 The Cross of St. Peter inverts the Latin cross based on this refusal, and claim of unworthiness, to die the same way as his Saviour. In the original Greek the word translated as "Peter" is Πέτρος (Petros) and that translated as "rock" is πέτρα (petra), two words that, while not identical, give an impression of one of many times when Jesus used a play on words. Furthermore, since Jesus presumably spoke to Peter in their native Aramaic language, he would have used kepha in both instances. The Peshitta Text and the Old Syriac texts use the word "kepha" for both "Peter" and "rock" in Matthew 16:18. John 1:42 says Jesus called Simon "Cephas", as Paul calls him in some letters. He was instructed by Christ to strengthen his brethren, i.e., the apostles. [Lk 22:31-32] Peter also had a leadership role in the early Christian church at Jerusalem according to The Acts of the Apostles chapters 1–2, 10–11, and 15. The Church of Jesus Christ of Latter-day Saints (LDS Church) teaches that Peter was the first leader of the early Christian church after the death and resurrection of Jesus Christ. While Mormons accept apostolic succession from Peter, they reject papal successors as illegitimate. In interpreting Matthew 16:13-19, LDS Church leader Bruce R. McConkie stated, "The things of God are known only by the power of his Spirit," and "that which the world calls Mormonism is based upon the rock of revelation." In his April 1981 general conference address, McConkie identified the rock of which Jesus spoke as the rock of revelation: "There is no other foundation upon which the Lord could build His Church and kingdom .... Revelation: Pure, perfect, personal revelation—this is the rock!" Joseph Smith, the founder of Mormonism, recorded in multiple revelations that Peter appeared to him and Oliver Cowdery in 1829, near Harmony Township, Susquehanna County, Pennsylvania, in order to bestow the apostleship and keys of the kingdom as part of a restoration of priesthood authority. 1 2 3 O'Connor, Daniel William (2013). 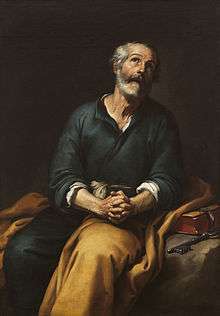 "Saint Peter the Apostle". Encyclopædia Britannica. Encyclopædia Britannica Online. p. 5. Retrieved 12 April 2013. 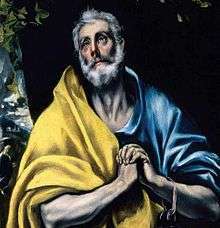 1 2 3 4 "CATHOLIC ENCYCLOPEDIA: St. Peter, Prince of the Apostles". 1 2 3 Dale Martin 2009 (lecture). "24. Apocalyptic and Accommodation" on YouTube. Yale University. Accessed July 22, 2013. Lecture 24 (transcript). ↑ Chapman, Henry Palmer (1913). "Fathers of the Church". In Herbermann, Charles. Catholic Encyclopedia. New York: Robert Appleton Company. ↑ "Bible Lexicon". Bible Lexicon. Retrieved 2010-09-12. ↑ Cepha or cephah is a Syriac word (Syriac: ܟ݁ܺܐܦ݂ܳܐ‎ Kîpâ);see John Maclean, M.A., F.R.G.S. A Dictionary of the Dialects of Vernacular Syriac as Spoken by the Eastern Syrians of Kurdistan, Northwest Persia, and the Plain of Moṣul Cambridge at the University Press, 1895. Accessed Jun. 16, 2011: p. 124. However, a "loose language" modern Aramaic dictionary may define Cepha Hebrew: כֵּיפׇא \ כֵּיף‎ yet not explain the origin of the word, e.g., Marcus Jastrow "Dictionary of the Targumim, the Talmud Babli and Yerushalmi, and the Midrashic Literature", 1903. Accessed Jun. 16, 2011: P. 634 It is unlikely that one will find this particular word ܟ݁ܺܐܦ݂ܳܐ in any non-Syriac dictionary of Aramaic. For instance, the Hebrew equivalent of Cepha (כֵּיפׇא‎) would not be present, while סֶלַֽע‎ (ßĕ'lặᵉ); i.e., rock, cliff, Petra; Karl Feyerabend, PhD "A complete Hebrew-English pocket-dictionary to the Old Testament", Cöthen, Germany, 1910. Accessed Jun. 16, 2011: P. 233 would, for סֶלַֽע‎ is a native Hebrew word. Within a "strict language" dictionary the word will be in its native and original form, thus "rock" will be translated into the language that is being used, e.g., "English-Hebrew dictionary". See: A. S. Waldstein "English-Hebrew dictionary", Jerusalem, 1920. Accessed Jun. 16, 2011: P. 442, where the word(s) for rock is translated as such: (הִתְנַדְנֵד−.פ, הִתְנוֹעֵעַ, הׇנֵעַ, נַדְנֵד, סֶלַע, צוּר, ש. (ריִֹק‎ and not כֵּיפׇא \ כֵּיף‎. 1 2 (Hebrew: כֵּיפׇא \ כֵּיף‎‎) is an indirect transliteration of the Syriac (ܟ݁ܺܐܦ݂ܳܐ), (Greek: Κηφᾶς) is a direct transliteration of the Syriac (ܟ݁ܺܐܦ݂ܳܐ), and (Hebrew: כֵּיפׇא \ כֵּיף‎‎) is a direct transliteration of the Greek. The Hebrew word (Hebrew: כאפא‎‎) is also a direct transliteration of the Syriac. (cƒ. Interlinear Peshitta Aramaic New Testament Bible Matthew xvi. 18). ↑ Metzger, Bruce M.; Coogan, Michael D. (7 June 2001). The Oxford Guide to People & Places of the Bible. Oxford University Press. p. 287. ISBN 978-0-19-976057-2. ↑ "What did Jesus mean when he said, "Upon this rock I will build my church"?". Bible.org. Retrieved 10 February 2015. ↑ Rienecker, Fritz; Rogers, Cleon (1976). Linguistic key to the Greek New Testament. Grand Rapids MI: Regency Reference Library (Zondervan Publishing House). p. 49. ISBN 0-310-32050-X. 1 2 May, Herbert G. and Bruce M. Metzger. The New Oxford Annotated Bible with the Apocrypha. 1977. 1 2 "Sermon by Leo the Great (440–461)". Ccel.org. 2005-07-13. Retrieved 2010-09-12. ↑ "Archbishop Stylianos of Australia". Retrieved 2010-09-12. ↑ "Patriarch H.H.Ignatius Zakka I Iwas". Syrianchurch.org. Retrieved 2010-09-12. ↑ "Syriac Orthodox Church in Canada - Identity of the Church". ↑ Myllykoski, Matti. "James the Just in History and Tradition: Perspectives of Past and Present Scholarship (Part I)". Helsinki Collegium for Advanced Studies, Finland. Retrieved 2014-04-02. 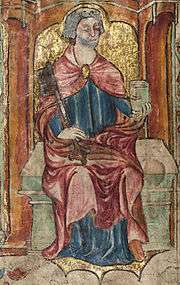 James the Just, the brother of Jesus, is known from the New Testament as the chief apostle of the Torah-obedient Christians. ↑ "Church History Book II, Chapter I, quoting Clement of Alexandria's Sixth book of Hypotyposes". Newadvent.org. Retrieved 2010-09-12. ↑ John Vidmar, The Catholic Church through the ages: a history. pp. 39–40. Books.google.com. July 2005. ISBN 978-0-8091-4234-7. Retrieved 2010-09-12. ↑ see Incident at Antioch; see also the section below headed "Road to Rome: Antioch and Corinth"
1 2 "Papal Basilica - Saint Paul Outside-the-Walls". ↑ Eusebius. "Church History Book III, Chapter 36". Retrieved 1 June 2015. ↑ Eusebius, in his Chronicle (A.D. 303) [Chronicle, 44 A.D. Patrologia Graeca 19:539]. ↑ Eusebius. "Church History Book III Chapter 36:2". newadvent.org. Retrieved 5 June 2015. ↑ Eusebius. "Church History Book III Chapter 22". newadvent.org. Retrieved 5 June 2015. ↑ Eusebius. "Church History Book I, Chapter 12:2". Retrieved 1 June 2015. ↑ Eusebius. "Church History Book II, Chapter 14-15". Retrieved 1 June 2015. ↑ "The Acts of Peter". ↑ of Corinth, Dionysius. "Fragments from a Letter to the Roman Church Chapter III". www.earlychristianwritings.com. Retrieved 1 June 2015. ↑ "ANF01. The Apostolic Fathers with Justin Martyr and Irenaeus". 1 2 Eusebius of Caesarea. "Church History Book VI, Chapter 14:6". Retrieved 1 June 2015. ↑ Lucius Caecilius Firmianus, Lactantius. "Of the Manner in Which the Persecutors Died Chapter 2". ccel.org. Retrieved 1 June 2015. ↑ "Was Peter in Rome?". Catholic Answers. August 10, 2004. Retrieved 9 November 2014. if Peter never made it to the capital, he still could have been the first pope, since one of his successors could have been the first holder of that office to settle in Rome. After all, if the papacy exists, it was established by Christ during his lifetime, long before Peter is said to have reached Rome. There must have been a period of some years in which the papacy did not yet have its connection to Rome. ↑ Brown, Raymond E. & Meier, John P. (1983). Antioch and Rome: New Testament Cradles of Christianity. Paulist Press. p. 98. ISBN 0-8091-0339-7. As for Peter, we have no knowledge at all of when he came to Rome and what he did there before he was martyred. Certainly he was not the original missionary who brought Christianity to Rome (and therefore not the founder of the church of Rome in that sense). There is no serious proof that he was the bishop (or local ecclesiastical officer) of the Roman church—a claim not made till the third century. Most likely he did not spend any major time at Rome before 58 when Paul wrote to the Romans, and so it may have been only in the 60s and relatively shortly before his martyrdom that Peter came to the capital. ↑ Cullmann, Oscar (1962). Peter: Disciple, Apostle, Martyr, 2nd ed. Westminster Press. p. 234. In the New Testament [Jerusalem] is the only church of which we hear that Peter stood at its head. Of other episcopates of Peter we know nothing certain. Concerning Antioch, indeed… there is a tradition, first appearing in the course of the second century, according to which Peter was its bishop. The assertion that he was Bishop of Rome we first find at a much later time. From the second half of the second century we do possess texts that mention the apostolic foundation of Rome, and at this time, which is indeed rather late, this foundation is traced back to Peter and Paul, an assertion that cannot be supported historically. Even here, however, nothing is said as yet of an episcopal office of Peter. ↑ Chadwick, Henry (1993). The Early Church, rev. ed. Penguin Books. p. 18. No doubt Peter's presence in Rome in the sixties must indicate a concern for Gentile Christianity, but we have no information whatever about his activity or the length of his stay there. That he was in Rome for twenty-five years is third-century legend. ↑ O'Connor, Daniel William (2013). 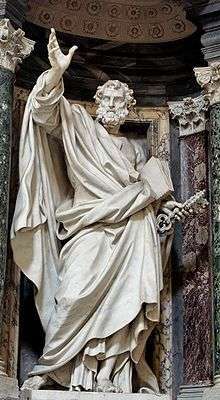 "Saint Peter the Apostle". Encyclopædia Britannica. Encyclopædia Britannica Online. p. 5. Retrieved 12 April 2013. [M]any scholars… accept Rome as the location of the martyrdom and the reign of Nero as the time. 1 2 3 Pieter Willem van der Horst, review of Otto Zwierlein, Petrus in Rom: die literarischen Zeugnisse. Mit einer kritischen Edition der Martyrien des Petrus und Paulus auf neuer handschriftlicher Grundlage, Berlin: Walter de Gruyter, 2009, in Bryn Mawr Classical Review 2010.03.25. ↑ Ignatius of Antioch. "The Epistle of Ignatius to the Romans". newadvent.org. Retrieved 15 August 2016. ↑ Kirsch, Johann Peter (1911). 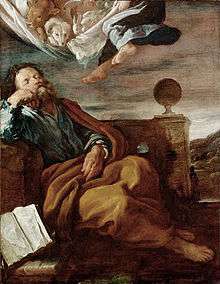 "St. Peter". In Herbermann, Charles. Catholic Encyclopedia. 11. New York: Robert Appleton Company. ↑ of Rome, Clement. "The First Epistle of Clement to the Corinthians". earlychristianwritings.com. Retrieved 1 June 2015. ↑ Quintus Septimius Florens, Tertullian. "Scorpiace Chapter 15". newadvent.org. Retrieved 6 June 2015. ↑ of Alexandria, Peter. "Canonical Epistle on Penitence Canon 9". newadvent.org. Retrieved 3 June 2015. ↑ Flavius, Josephus. "Jewish War, Book V Chapter 11". ccel.org. Retrieved 1 June 2015. ↑ presbyter, Caius (Gaius). "Dialogue or Disputation Against Proclus (A.D. 198) in Eusebius, Church History Book II Chapter 25:6-7". newadvent.org. Retrieved 1 June 2015. ↑ saint, Jerome. "De Viris Illustribus (On Illustrious Men) Chapter 1". newadvent.org. Retrieved 5 June 2015. 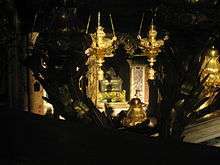 ↑ "CATHOLIC ENCYCLOPEDIA: Tomb of St. Peter". ↑ "The Papacy and the Vatican Palace". ↑ Wall, J. Charles. (1912), Porches and Fonts. Pub. London: Wells Gardner and Darton. P. 295; "Venerable Bede,Historia Ecclesiastica Gentis Anglorum: The Ecclesiastical History of the English People. Book III, Chapter 29". Fordham.edu. Retrieved 2010-09-12. ↑ "The Bones of St. Peter". Saintpetersbasilica.org. Retrieved 2010-09-12. ↑ Associated Press (2013-11-24). "Vatican displays Saint Peter's bones for the first time". The Guardian. Retrieved 2013-11-24. ↑ "Bible, King James Version". ↑ "THE BOOK OF THE APOCALYPSE OF BARUCH THE". ↑ "Knowing the End From the Beginning". google.ca. ↑ "The First Letter of Peter". google.ca. ↑ "She Who Restores the Roman Empire". google.ca. ↑ Eusebius. "Church History Book II Chapter 15:2". hypotyposeis.org & newadvent.org. Retrieved 4 June 2015. ↑ "Babylon in the New Testament". International Standard Bible Encyclopedia Online. 1 2 Joyce, G. H. (1913). "Pope". In Herbermann, Charles. Catholic Encyclopedia. New York: Robert Appleton Company. ↑ "Strong's Greek: 2786. Κηφᾶς (Képhas) -- 9 Occurrences". ↑ "John 1:42 Greek Text Analysis". 1 2 "Peter the Rock". Catholic.com. 2004-08-10. Retrieved 2010-09-12. ↑ Veselin Kesich (1992). "Peter's Primacy in the New Testament and the Early Tradition" in The Primacy of Peter. St. Vladimir's Seminary Press. pp. 61–6. ↑ "WELS Topical Q&A: Responses to previous questions". Wisconsin Evangelical Lutheran Synod. 2013-08-08. Archived from the original on 8 August 2013. Retrieved 2015-10-05. ↑ "SOME THOUGHTS ON MATTHEW 16:18". ↑ Eckert, Harold H. "The Specific Functions of the Church in the World" (PDF). Wisconsin Lutheran Seminary. Retrieved 4 Feb 2015. ↑ ""Primacy of St. Peter" - by Dr. Thomas Athanasius". Syrianchurch.org. Retrieved 2010-09-12. ↑ "Doctrine & Covenants 27:12–13". Scriptures.lds.org. Retrieved 2010-09-12. ↑ "Doctrine & Covenants 128:20–21". Scriptures.lds.org. Retrieved 2010-09-12. 1 2 3 4 5 6 7 Vander Heeren, Achille (1911). "Epistles of St. Peter". In Herbermann, Charles. Catholic Encyclopedia. 11. New York: Robert Appleton Company. 1 2 saint, Jerome. "Epistle 120 – To Hedibia Question 11". tertullian.org. Retrieved 9 June 2015. ↑ Eusebius. "Church History Book VI, Chapter 25". newadvent.org. Retrieved 11 June 2015. ↑ saint, Jerome. "De Viris Illustribus (On Illustrious Men) Chapter 1". newadvent.org. Retrieved 9 June 2015. ↑ "Gospel of Thomas 13". ↑ "Gospel of Thomas 114". ↑ "Gospel of Mary 9:4". ↑ "Gospel of Mary 9:6". ↑ "Gospel of Peter 14:3". Cygnus-study.com. Retrieved 2010-09-12. 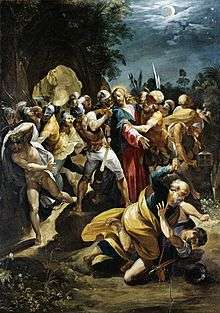 ↑ "Oldest known images of apostles found". CNN.com. Retrieved 17 November 2013. ↑ "Arthur Drews - The Legend of St. Peter". Egodeath.com. 2005-10-10. Retrieved 2010-09-12.